Sorry, but I had to do it! A little history first. 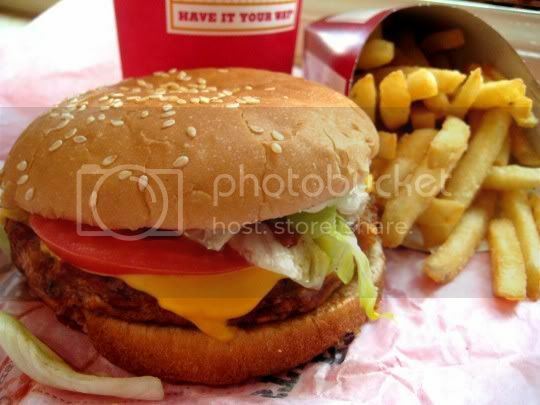 Burger King is one of the only U.S. fast-food chains that offers a veggie burger. McDonald's carried the Yves brand for a while a few years back, but it was discontinued (not suprisingly). BK carried veggie burgers for quite some time before McDonald's introduced theirs, and it fortunately remains a staple on the menu. I remember first trying their version years back...and how disgusting it was. I was so excited that I could order fast food again, and then so utterly disappointed that it tasted like a pile of bland, cold mushiness. Fast forward a few years, and it seems like they have greatly improved. The BK Veggie patty tastes (and looks) like the Gardenburger brand. Nonetheless, it is tasty...especially with a slice of American cheese (note, they do charge extra for this)! Completing the burger is iceberg lettuce pieces, one to two tomato slices, and ketchup and mayonnaise on a white bread bun. The patty itself is a blend of veggies and grains, but you can particularly taste the bell peppers, olives, and water chestnuts. I hate olives...but here, they aren't that bad. The BK Veggie combo includes fries and a drink. The fries are your typical fast-food triple-quadruple fried-and-frozen fries...and they taste this way too. The first few are good (especially if they're fresh), but after a while, they get cold, hard fries thing going on and aren't too appetizing about halfway through. Yet you keep eating them, because that's what fast food is there for, right? Keep in mind, this burger is nowhere near "healthy" or vegan. I believe the actual patty is vegan, but the bun it's served on is not...nor are the cheese and mayo I like to include. You probably can rest assured, however, that the patty is not cooked on the same grill as the meat burgers. Its texture and those chewy outer edges surely came from the microwave. Eat here again? Yes, this is my guilty fast food pleasure. Bad, I know. Also good with a packet of barbecue sauce. Im a fan of the Garden burger. It is very tasty.